Currently receive or have received EI Benefits? Contact your local Workers’ Compensation Board to find out if you are eligible for funding/sponsorship! Must have a current WCB claim. Gabriel Dumont Institute/Dumont Technical Institute assists Metis individuals with funding for career & employment training. Contact the local GDI office nearest you! May be limitations on funding amounts. 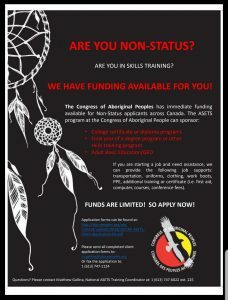 Contact your band or tribal council to start a funding application! You can also contact ASETS (Aboriginal Skills & Employment Training Strategy) or the Congress of Aboriginal Peoples. Saskatchewan Aboriginal Women’s Circle Corporation assists Aboriginal women in many areas including assistance with cost of education. If you do not qualify for any funding/sponsorship, you can always look towards obtaining a loan through the bank. For financial assistance, contact your local financial institution (bank) to apply for a student line of credit or personal loan. Registered Education Funds can be applied. Please Note: the HEO training programs we offer are under the required minimum program length of 6 weeks in order to qualify for a student loan through the government. If you are seeking funding or financing to cover your program costs and are approved, the School requires a letter of confirmation in order to officially enrol you in the program. This confirmation will be due 1 week prior to the program start date, to allow enough notice to any enrolled students, in the event that the program should be cancelled due to a low enrolment rate.